When the excess of Hollywood became too much, he made his escape to the heart of Provence. Today, he's probably the world's most famous Francophile—without even trying. In the depths of rural France, it can still be hard to keep a low profile when you look like Johnny Depp. When an omnipresent A-list actor suddenly drops out of view, you automatically assume the worst. On Planet Hollywood, a string of hits means little if you tread on the wrong person's toes. You might expect to find one-time gossip column-fodder now taking embarrassing bit parts or filed in the 'burnt out/dried up' ward of a rehabilitation clinic in Beverly Hills. A glance at Johnny Depp's CV reveals a few tell-tale gaps, the most recent, a two-year hiatus between solving the Jack the Ripper case in From Hell and swaggering about in the all-conquering Pirates of the Caribbean. For a mysterious man with a dark past, the holes don't look good. Rest assured, though—that time has been spent wisely. Johnny gladly swapped the high life to devote time to his family. The actor claims the birth of his daughter, Lily-Rose Melody, changed him for good. "I'd like to think I was reborn on 27th May, 1999," Johnny says. "Until that moment, I had been possessed with 'me' and 'my career.' Suddenly, there was someone who depended on me, who I was responsible for." It's been an eventful couple of years. Having settled down in France with his partner Vanessa Paradis and two children—Lily-Rose Melody and Jack—the actor has made the transition from Hollywood player to family man with his career intact. Johnny has also slipped into the rural French way of life with ease. While he divides his working hours between his apartments in Paris and Los Angeles, it's the family's farmhouse in Provence he calls home. "I was very lucky that something steered me to France," as he tells it. "I love America, but it's wonderful to get back to France and be living in a tiny village with nothing around. You can go to the market, walk about, buy fruit and vegetables—the things they did 100 and 200 years ago. We have moments when we're sitting in our house and think, 'Thank God we escaped'." Things started working out the moment Johnny arrived in France. He first met Vanessa by chance, while filming with exiled director Roman Polanski. "I happened to be sitting in this restaurant one night. I noticed a woman with her back to me. I was kind of intrigued by her neck of all things, and then she turned around and looked back and we made eye contact. That was all it took. I was completely in love—she had me!" "It's completely transformed my outlook. I was functioning in some strange kind of fog before we met. Though I had a lot of outward success as an actor, I was very miserable and unhappy for most of that time. But being with Vanessa and having a family with her has just made things come together for me. I needed to have something that seemed real and meaningful to me. And I've found that. It doesn't get any better than this." Life, it seems, is sweet in his new residence. "France has a great culture and an amazing history. People here know how to live! In America, they've forgotten all about it. LA is too fast, too pacy. There is too much of everything—just too much. In France, I can have distance and sort of see the game for what it is, rather than trying to understand it from the inside." Johnny's international exposure seemed to run hand in hand with his own confusion as to how he got to be in this position. "I hate fame. I've done everything I can to avoid it," he once said. The lure of France seems obvious, then. "It's much easier for me here. No one cares who I am and it's very rare that anyone acknowledges me in the street or takes my photo. The only people who bother us are the paparazzi, but even they're bored with watching us take our kids for a walk or seeing me wearing bad clothes and a funny hat." But even here, Johnny is far from anonymous. The actor's impressive body of work should make even the most unobservant of French countryfolk think they might have seen him before somewhere. 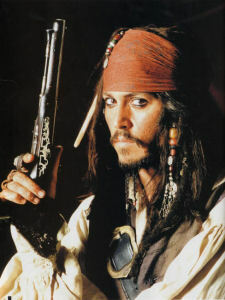 His presence has been boosted by the success of Pirates of the Caribbean, but he never really plunged into obscurity. His movie debut was in the original A Nightmare on Elm Street, but he really made his name with skewed director Tim Burton in Edward Scissorhands—the first of several collaborations. Johnny has often made what looks like a bad move that turns out to be a step in the right direction. 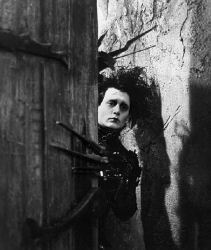 Instead of starring in Speed, he chose to appear in Jim Jarmusch's cult Dead Man. He appeared in drag in Before Night Falls and Ed Wood, again with Tim Burton. Johnny also joined Burton for Sleepy Hollow and is set to reprise the part of Willy Wonka in Burton's new adaptation of Roald Dahl's Charlie and the Chocolate Factory. His dark side is, perversely, the one we are most familiar with. Not just content to work with Burton, Johnny pulled off the near impossible in Fear and Loathing in Las Vegas—this time, with the gleefully macabre Terry Gilliam. 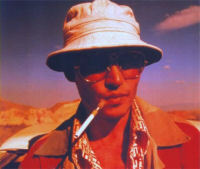 In this adaptation of the supposedly unfilmable 'novel' by Gonzo journalist Hunter S. Thompson, Johnny spent months with the author, developing a close friendship—given that both were born in Kentucky and have had their dealings with life's indulgences, you would expect the pair to get on. The result speaks for itself—the actor's portrayal of Thompson is spot on. "One of the great things about Johnny is that I don't think he has any ego or vanity when it comes to becoming a character," Gilliam says. "A lot of actors refuse going all the way in giving up their good looks. Not so with Johnny. As far as I'm concerned, Johnny Depp is the best actor of his generation—there's no limit to his capabilities." In no two roles do we see the same Johnny Depp. But we always see snapshots of other people—Ichabod Crane, his character in Sleepy Hollow, is apparently part Sherlock Holmes, part Roddy McDowell and part Angela Lansbury. In Ed Wood, there's a sly nod to the Tin Man in The Wizard of Oz and, of all people, Ronald Reagan. It's obvious Johnny doesn't fit into the Hollywood mold. Too skilled to be wasted on the more vacuous mainstream films, he's also modest—a rare quality in his line of work. In fact, he won't even watch one of his own films. "I condition myself to believe that once the movie is done, my job is done," he says repeatedly. "I'm really proud of all the films, all the experiences. Performance, that's another thing. It's not for me to judge." He may not be watching, but his children are. Their influence might well be the motivation behind his recent move towards more family-friendly material—his latest, Finding Neverland , as well as Pirates of the Caribbean. The latter, at least, seems to have made a mark on his daughter. "A woman in some restaurant asked what her parents did," he recalls. "Lily-Rose said, 'Well, my mummy's a singer.' And the lady said, 'Oh yes? What does your daddy do?' and she said, 'My daddy's a pirate.' 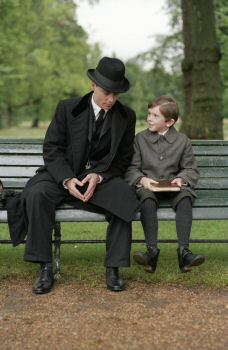 "
"When I was approached to do Finding Neverland, it was certainly a plus being a film my kids could watch," he says. However, his other recent project The Libertine is a different matter. "I think they'll have to wait to see The Libertine. Something like 40 years." He can run away and hide from his fame, but he can't escape it. They do, after all, have television. "I was in France last year, and Ed Wood came on television. It was dubbed in French, and it was so surreal. So, I watched for about 10 minutes. Another time, What's Eating Gilbert Grape came on. I just turned the TV off and walked away." Walking away seems to be his answer. "It has done wonders for my relationship with Hollywood," he says on his move away with his family. "I'm so removed from it that I don't know anything. I mean, I don't know who anybody is. I don't know who's famous. I don't know who's not famous. I don't know who's rich, who's poor, who's successful, who's a drag. I don't know anybody. I don't know what made money and what didn't make money. And it's great!"